The factory speakers are junk. I have never seen worse car speakers. The ones in the front doors have a really tiny magnet, and are riveted in. The ones in the rear doors are even smaller, and are also bolted in. The first 3 pictures are my 2012 factory speakers. 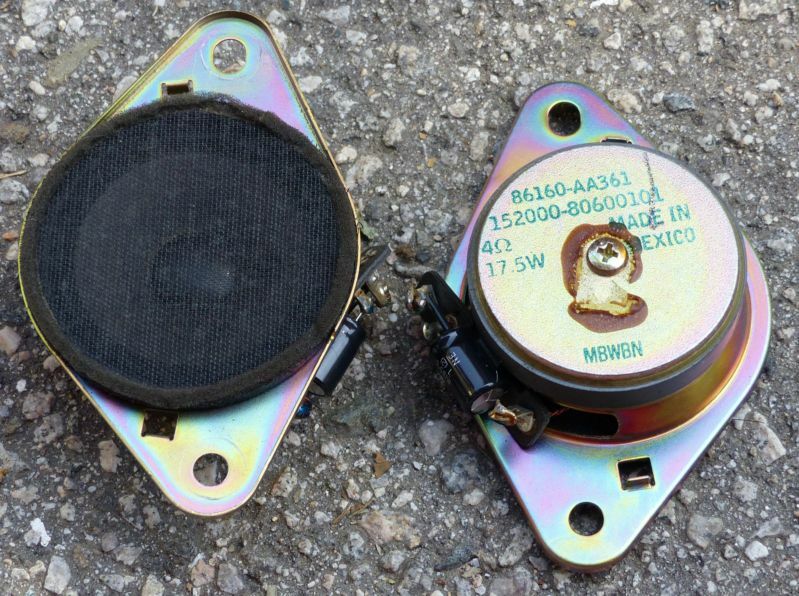 The next two pictures are the factory speakers from my 2002 camry. 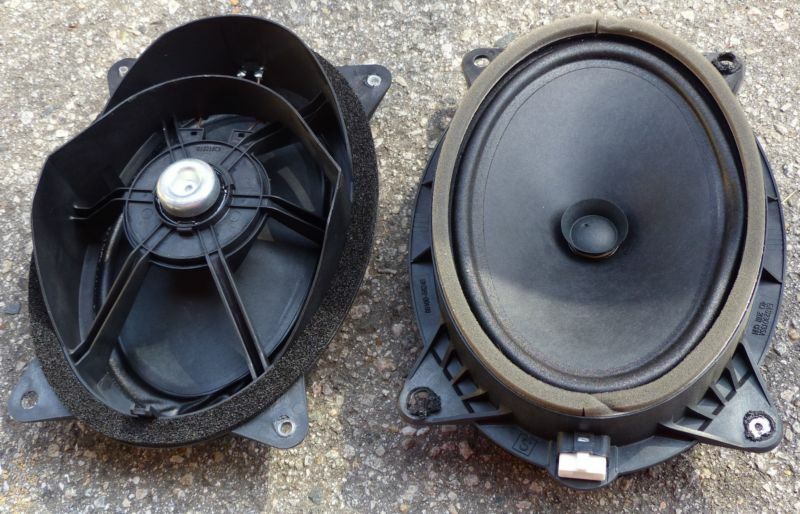 The 2002 camry is an inexpensive car, but its factory speakers look far better than the 2012 prius speakers. The first picture is the 'squawker' which is the dash speaker. The magnet is hidden under the white plastic, and is under then black area in the center. For comparison purposes, the fourth picture is the camry dash speakers. Note the magnet is significantly larger, almost the size of the speaker cone. The second picture is the prius front door speakers. The magnet is roughly an inch in diameter. 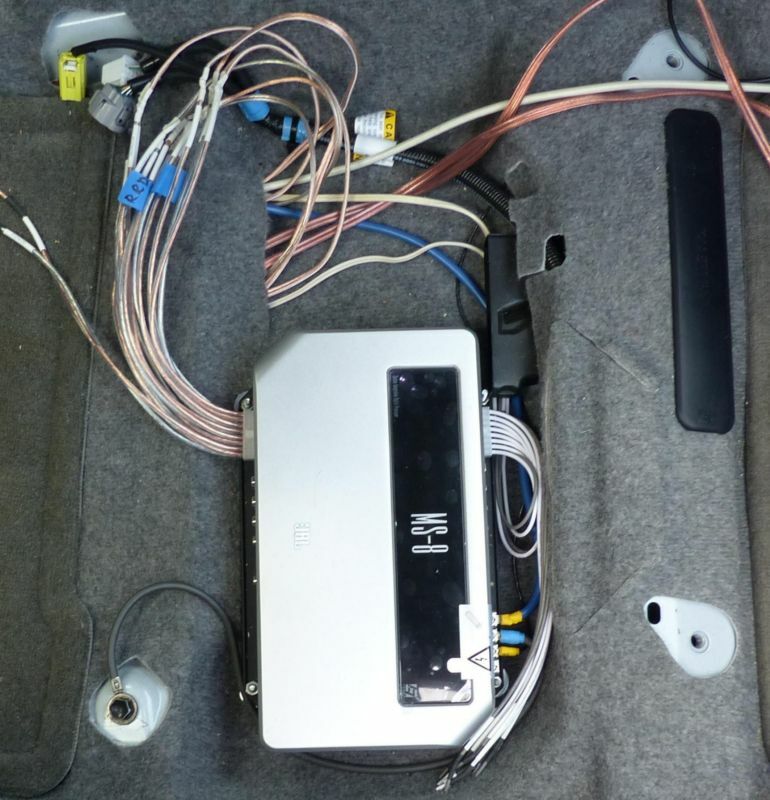 The fifth picture is the 2002 camry front door speaker. It is interesting to note that the camry speaker has a plastic cone, which is generally more expensive and higher quality than the prius with the paper cone. The magnet is significantly larger. 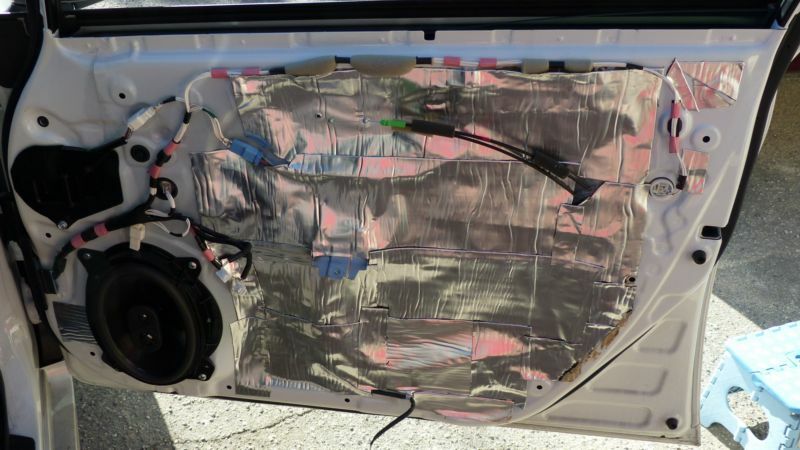 The third picture is the 2012 prius rear door speakers. The magnet is under the black raised area in the center. It is also interesting that all the speakers other than the dash speakers have plastic frames. No aftermarket speaker that I know has a plastic frame; they all use metal. Perhaps it is lighter, or perhaps it is easier to form than cutting and drilling a metal frame. 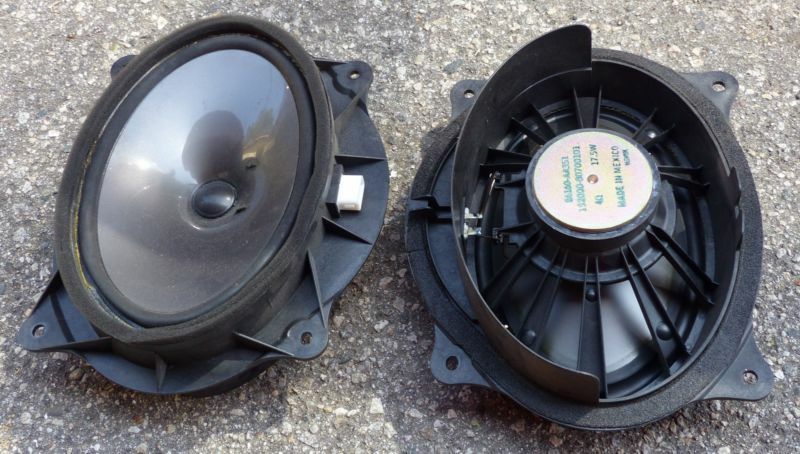 I have no idea why Toyota uses such junky speakers in the prius. No doubt they are saving a bit of money. Clearly the speakers had to be replaced to improve the sound. Once you have decided to change your speakers, there are quite a few options. Prices range from under $10 to several hundred dollars. I have a few suggestions. You will be ripping apart the car and putting it back together again (or paying someone else to do it). Therefore you will want to avoid the cheapest speakers, as you will likely have to replace them later on. The replacement speakers have to fit. Toyota cleverly uses non standard speaker sizes, for reasons that escape me. So you will have to buy or build speaker adapters to make the standard sized speakers fit in the non standard holes. In some cases, like the dash speakers, you will almost certainly have to cut parts of the dash in order to make the aftermarket speakers fit. Speaker cones come in a wide variety of materials. There are advantages and disadvantages to all of them. Paper is the least expensive material. I don't like it for automotive applications, as cars are subject to heat, cold, vibration, and moisture. Speakers have different frequency responses. For example, the Polk DXi350 specify the frequency response of 90hz-22khz. The Kenwood KFC-1664S specify the frequency response of 35hz-22khz. What neither specify is how many decibels +- this frequency response is. Therefore, the frequency response is almost completely meaningless. 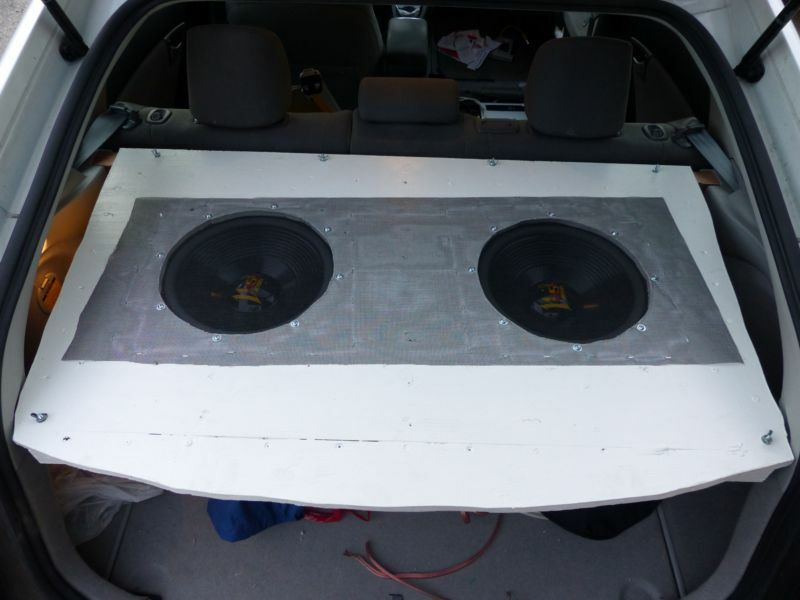 In their defense, mounting the speaker in a car will effect the frequency response, significantly at the low end. A very important specification is the efficiency. It is typically measured at 1 watt input. For the Kenwood KFC-1664S, it is 92db (implied is at 1 meter distance). So the speaker will produce 92db at some frequency with 1 watt going into it. Some sneaky speaker makers such as Infinity have 2 ohm speakers, and specify their efficiency at 2.82 volts. This works out to 2 watts, which will produce numbers 3db higher than at 1 watt. Efficiency is very important, and one of the reasons I picked the speakers that I did. Every change of output that is 3db requires doubling the power. The Pioneer TS-a878 speakers that I originally put in the dash are rated at an efficiency of 88db, which is 3db less than the 91db of the Polks. So to get the same volume, requires twice as much power. So instead of 20 watts, you would need 40 watts. Some woofers are very inefficient. If one is 85db efficient and one is 91db efficient, that means the lower one will take 4 times as much power to produce the same volume. So instead of getting a 100 watt amplifier, you would need a 400 watt amplifier to produce the same volume. Some so-called 'pro' speakers have an impedance of 2 ohms. There are several problems with this. First, you will need an amplifier capable of safely driving 2 ohms. I suspect few if any OEM amps can do this. Next you will need to use pretty thick speaker wires. Some people go overboard on thick speaker wires. However, with 2 ohm vs. 4 ohm speakers, you will need to double the cross section of the speaker wire to have the same voltage drop as you would get with 4 ohm speakers. This means decreasing the AWG number by 3. As an example, if you are using 18 gauge speaker wire (which makes sense except for subwoofers), you should use 15 gauge speaker wire. If you use 14 gauge wire for 4 ohms, you should use 11 gauge wire for 2 ohms. 4 ohm speakers are an artifact from before switching power supplies were available for cam amplifiers. In order to get more power while only working with 12 volts, the impedance of the speakers was reduced to 4 ohms. This allowed a doubling of power at 12 volts compared to 8 ohms. Now, virtually all audio amplifiers have switching power supplies which converts the 12 volts to whatever voltage is desired for the amplifier. If car audio people were smarter, they would switch to 8 ohm speakers. This would enable thinner wire to be used for the same amount of power per speaker. The most critical speakers in the car are the dash speakers. The door speakers are positioned so that they direct the sound towards your ankles. Since that is no where near your ears, you don't hear them very clearly. The lower frequencies come through clearer, but most of the higher frequencies will come from the dash speakers. Unfortunately, the OEM speakers are dreadful. They are called 'squawkers', which is a kind term for them. First you pull off the A pillar plastic trim. 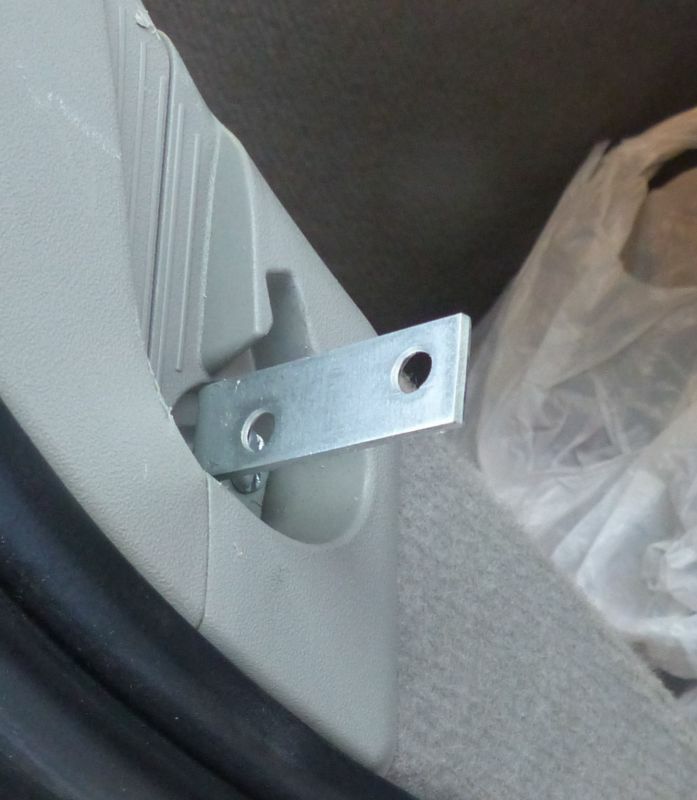 When doing this, you have to rotate a black tab 90 degrees (as it holds the trim in during airbag deployment). The first time I did this, I was nervous as the A pillar air bag is visible. I disconnected the battery first. This isn't really necessary, and I didn't bother doing it again. Of course, if the air bag goes off, don't blame me. Next you remove the grill, exposing the squawker. This speaker is wired in parallel with the front door speaker as Toyota was too cheap to have a 6 channel amp. They used a 6 or 8 microfarad non-polarized capacitor in series with the speaker, to add impedance at lower frequencies. I added a 100 microfarad non-polarized capacitor, as I wanted my new speakers to have some lower frequency response. I also added a 2 ohm resistor in series with the dash speakers as well as the door speakers. This way, I would reduce the load of the speakers being in parallel, and hopefully not cook the entune amp, which is likely under 5 watts RMS per channel. If the dash and door speakers are 4 ohms each, by adding the 2 ohm resistors to each of them, the worst case impedance the amp will see is 3 ohms. I used a really nice Pioneer TS-A878 speaker which required a bit of trimming of the dashboard plastic. I was very careful and removed a bit at a time to minimize removing too much. I also removed the interior seal of the grill as it seals to the squawker speakers. This change made the biggest improvement to the sound quality. The Pioneer speakers are a 2 way unit, and have much better high frequency response than the squawkers. They also have much better low frequency response, thanks to my 100 microfarad capacitor. To explain exactly what the 100 microfarad capacitor does, lets assume the original capacitor is 10 microfarads and the new, combined capacitor is 100 microfarads. At 1 kHz, 10 microfarads has a capacitive reactance of 16 ohms, which is 4 times as big as the speaker. The 100 microfarad is 1.6 ohms. So the factory squawker power will be at 20%, and mine will be at 71%. At 100 Hz the factory will be at 2%, and mine will be at 20%. I ended up replacing the Pioneer TS-A878 speakers with Polk Audio DXi350 speakers. The specs on them claim an efficiency of 91db at 1 watt, compared to the Pioneer's 88db at 1 watt. Therefore, they should be 3db louder. I switched one, but I didn't notice much of a difference. I wonder how accurate the efficiency specs of the speakers are. If a company lists the 'total frequency resp-once of 90Hz-22kHz', without any +- db specs, that is a bad sign in my eyes. One could say all the car speakers are specified this way. I know either the Pioneers or the Polks are vastly superior to the factory squawkers. I removed the door skins to replace the OEM speakers. Toyota uses weird sized speakers which match nothing else in the world. You can buy adapter plates from Crutchfield or the like, but they don't fit exactly. You will also have to drill one or two holes in the steel car door inner panel. You will also have to fill a gap where the old speaker was, which is not covered by the adapter plates. I used strong 2 inch wide tape. If I was doing it again, I would fabricate my own adapter plates to fit exactly. Another nice 'feature' is that Toyota rivets the speakers in. You will have to drill the rivets out. This is a bit of a hassle. If the bit is too small, it will just spin the rivet, which will melt the plastic of the speaker frames. I know. 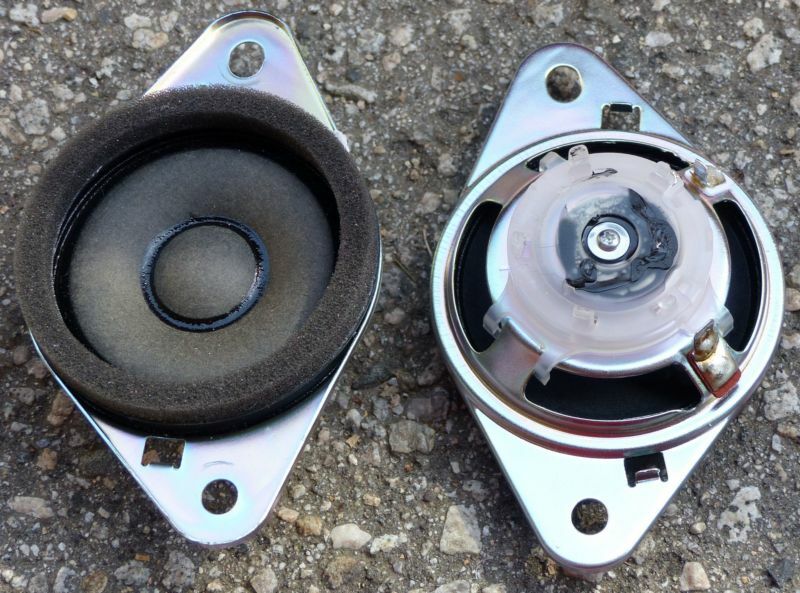 After the OEM speakers are removed, you will note there is no sound dampening material. Actually, if I recall correctly, there is a tiny strip inside the front door. I bought 'peel and seal', which is cheap. I cut it into pieces that varied in size and mostly covered the outer door skins. It is pretty easy to do most of the door though the speaker holes. This was very noticeable when knocking on the exterior of the doors. You can use more expensive stuff if you want. 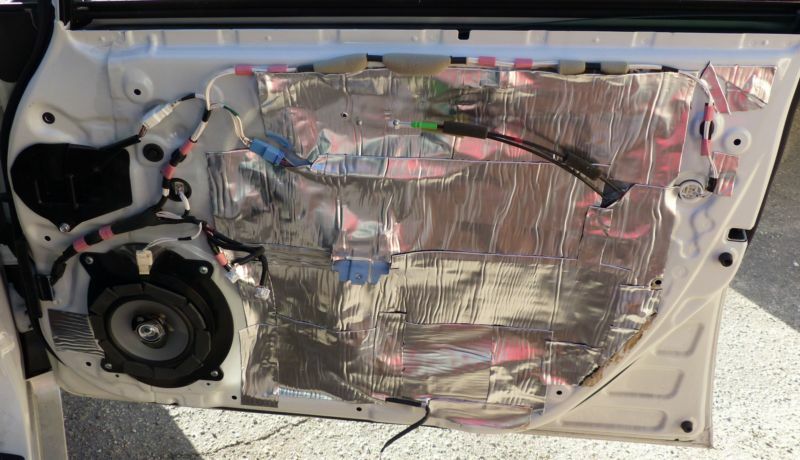 You can also cover the inside of the interior part of the door, but that will make it very hard to service the stuff inside the door. I used Kenwood KFC-1664S speakers, as they are reasonably efficient, and cheap and fit in the front and rear doors. The rear door speakers are pretty useless. Perhaps if you sit in the back you might notice them, but sitting in the front, they do pretty much nothing. I thought I would get better bass when I put the rear speakers in, but I didn't notice any improvement. Car doors are not ideal speaker enclosures. They are made out of thin steel which rings when sound is applied unlike MDF (medium density fiberboard), which is what almost all quality speaker cabinets are made out of. There are a bunch of holes in the door where air can leak in and out. If air can leak out, so can sound. In addition, most doors have large areas covered with clear plastic. This is so you can access the inside of the door if you have to repair something inside the door, such as the window mechanism. The clear plastic will vibrate when sound is applied, which is bad. I ended up covering it up with peel and seal. I probably should have removed the plastic, cut some sheet metal to cover the hole, and then covered it with the peel and seal. But I just used the peel and seal. It can be easily cut through if it is necessary to service the door interior. There are two places where the door skin bolts to the door. 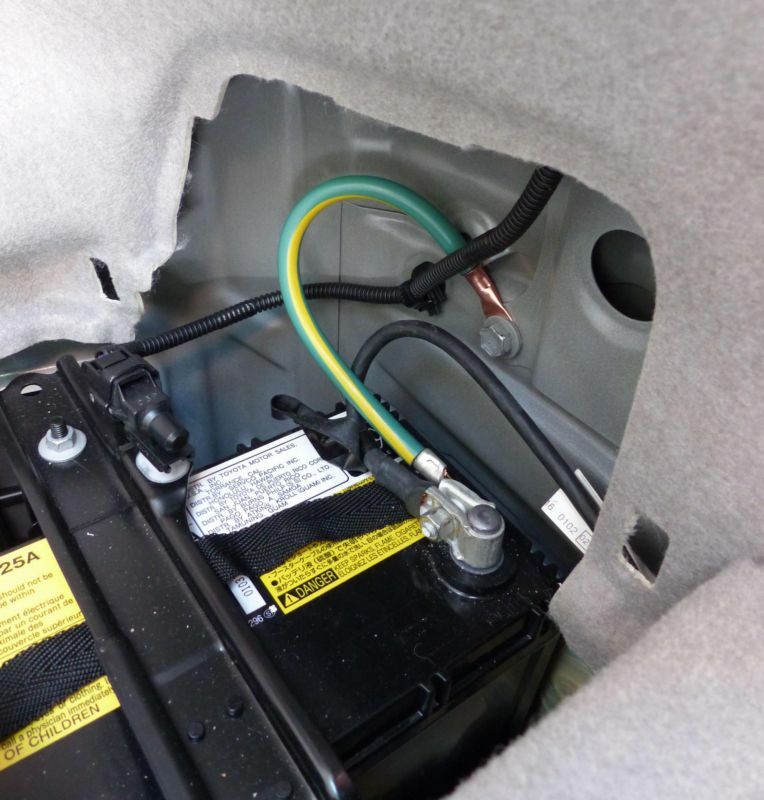 There are several electrical connectors that attach to the door skin. There are also 2 cables that attach to the door skin. These have to still be accessable after adding any sound deadening. I decided to upgrade the front door speakers to 6x9 inches. Crutchfield doesn't sell the adapters for this, but they are just METRA 82-8146 adapters. I decided to get JBL GT6-69 speakers as they are 93 db efficient, vs the older Kenwood KFC-1664S speakers which are 92 db efficient. That is the same difference between a 100w amp and a 126 watt amp. Also, the 6x9 speakers are much bigger than the 6.5 inch diameter Kenwoods, with roughly 28% more surface area. The JBL speakers have a feature called 'Plus One'. From their website: "Plus One woofer cones have up to 30 percent more surface area than standard cones, increasing bass output and efficiency." That sounds quite impressive. It wasn't clear to me how they made their cones bigger than their competitors. I happened to have recently purchased some Kenwood KFC-6965S 6x9 speakers. It turns out that they Kenwood speakers have exactly the same dimensions as the JBL. I didn't measure the depth of the cone, but the height and width. Visually they both seemed to have similar depths. Based om my measurements, the JBL is 0% more surface area than the Kenwoods. I suppose technically 0% is 'up to 30%', but I think it is a bit misleading. I am not impressed. You will need to run a power wire for each amp (unless you use a silly power distribution block). The standard AGU glass cylinder car stereo fuses are marginal. If they use spring loaded contacts, they are useless for any serious current. The typical screw down set screws used by the 5mm diameter car stereo fuse blocks are also useless, as it is very difficult to get a good, low resistance connection. Despite having some lying around, I bought some maxi-fuse holders. Maxi-fuses are bladed fuses with a low resistance connection. They look like standard bladed fuses used for cars, but on a larger scale. They are available in up to 100 amps, which is much more than I will need. I bought some inexpensive inline fuse holders with 8 gauge wire. I attached the 8 gauge wire to the battery terminal with a ring terminal using my crimp tool. I attached a long run of 8 gauge wire to the other end with a coupler, which is a tube of metal with a 8 gauge hole, designed to be crimped. I removed the insulation of the coupler before crimping, and put it back after crimping. I also covered the insulation with some heat shrink tubing. I used a heat gun (about $10) to shrink the heat shrink tubing. I will be using a JBL MS-8 amp as well as a subwoofer amp, so I installed 2 fuses and 2 runs of 8 gauge wire for the 2 amps. There is another type of fuse, that has screw down terminals called the ANL or ANE type of fuse. It is a good design, but for higher currents than I care about. I recommend reading about fuses at FUSES They have pictures and lots of useful info. Next, I needed s source of switched power to turn the amp on. I decided to use the cigarette lighter. I loosened up the front of both side panels of the lower central console. Next, I pushed out the panel with the cigarette lighter from behind. I disconnected the cigarette lighter wiring. The black wire is the positive. There isn't much room to work, but I managed to strip away some insulation from the wire. Next I wrapped my signal wire around it. I soldered it up, and wrapped it with electrical tape. I secured the electrical wire with a cable tie, as I had electrical tape loosen up. If I had some shrink wrap tape, I would have used it instead. I have some insulation displacing crimp on wire taps, but I have had them come loose, and since it is a bit involved in accessing, I decided to solder it. I routed the wire along a thin black loom wiring harness that went to the front left area of the passenger seat. ; I had to pull up the carpeting a bit around the central console to route the wire. I have 2 pictures, one before I soldered the wire, and the second showing the taped and cable tied result. Well, I wired up the rear door speakers. It would have been nice to remove the door connector, but I have been unable to do so. I have heard that it is very difficult, and likely to break when taken apart. The reason is to be absolutely sure which wires go to the speakers. So there is no excuse for any amplifier not to list these specifications. If the amplifier doesn't have detailed specs, I would avoid it. The only type of power output that means anything is RMS. If the amp specs doesn't say RMS, they should generally be ignored. I know the Blaupunkt amp from 2001 doesn't say RMS, but it is a 13 year old document, and given the rest of their specs, I am sure they meant RMS power. Most car amplifiers are class A/B. Using this design, typically efficiency is about 30%. A highly efficient class A/B amp will be about 50% efficient. Using switching technology such as class D or class T will allow efficiencies of up to 80% to 90% (my Blaupunkt class T amp efficiency goes up to 78%). Most car amplifiers don't have cooling fans or really large heatsinks. Car amplifiers are often places in areas that are hot or have poor air circulation. They will likely overheat if they put out significant amounts of power. Decent amplifiers include a thermal shutoff circuit. The Blaupunkt will shut off if the heatsinks reach 85C. Amplifier power doesn't really matter. What matters is the amplifier power combined with the speaker's efficiency. My subwoofers have an efficiency of 93db. I saw some other subwoofers with an efficiency of 85db. My 93gb efficient woofers require 6 times less power to make the same volume as the less efficient 85db subwoofers. To make that clear, with a 93db speaker and 100 watts, you will get the same sound pressure level (SPL) as a 85db speaker and 600 watts. Now some efficient speakers may have higher distortion or worse frequency response than less efficient speakers. But any speaker below 90db or so, should be suspect of having a bad design and generally avoided. There is no reason not to use a switching class amplifier in car stereo applications. They may cost a few dollars more, but they will make significantly less heat, and likely be more reliable than class A/B amplifiers. My JBL MS-8, is a class D amplifier. I am amazed at some class A/B amplifiers that are rated at high power levels, and have minimal heatsinks. My Blaupunkt amp was known as 'the plastic amp' because it had a plastic shell. A less efficient amplifier would melt the plastic. Well, I wired up the JBL MS-8 amp. It is secured to the carpet with 4 bolts with the heads going from under the carpeting up. I used large washers on either side of the carpeting to distribute the load. The first picture shows the slit I cut in the carpet to allow all of the wires to come through. I will be using convo-tubing to dress all of the wires. The clear wires are the speaker wires, which connect to the amp in the back. Channels 7 and 8 will be for my subwoofer once I build it. Eventually, I will use an outboard amp for more power for the subwoofer. The gold wires that don't seem to go anywhere are the sub speaker wires. When I pulled the two unswitched power wires for the amps, I also ran the subwoofer wires. The blue wire is the 12v to the amp. It is 8 gauge. I had to trim it down a bunch to fit the 10 gauge ring terminal to the amp. The gray wire is a 10 gauge ground wire. I used my ratcheting crimper to make all the power connectors. 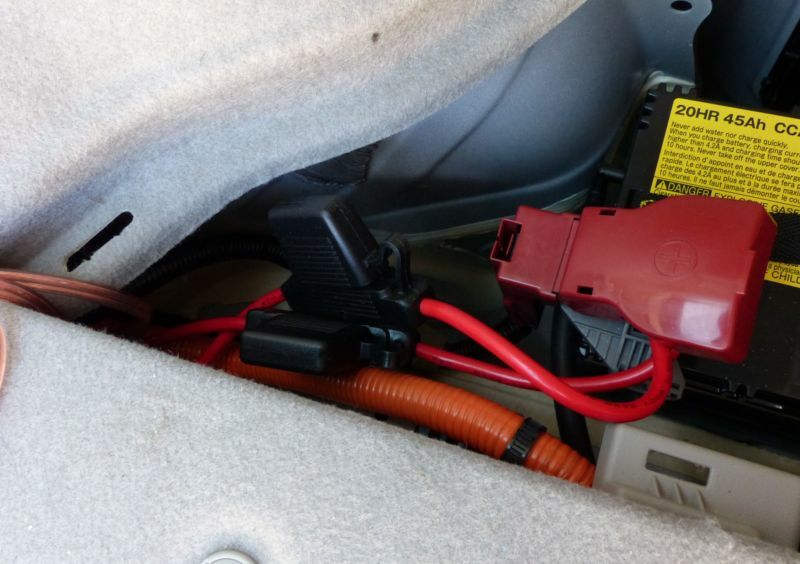 You can see the crimp on the ground wire where it attaches to the seat bolt. The thick white wire is the 8 gauge wire for the subwoofer amp, which goes nowhere for right now. The black wire is the switched 12v wire that I ran from the cigarette lighter. It is the only wire that doesn't come from the rear carpeting area. The smaller white wires are the front channel outputs from the head unit. They go to the speaker level input connector in the front of the amp. I routed the input wires, the 12v wire and the switched 12v wire under the heater vent at the front of the seat. The rest of the inputs to the amp are not used, and just go to the side. I added black heat shrink tubing to the unused inputs and outputs so nothing would short out. I also added heat shrink tubing to the ring terminals, as I had to cut the insulation in order to use my crimping tool. Calibrating the ms-8 was easy. The one thing it doesn't do is adjust levels to each speaker, so I sent the fader a few notches back as most of the sound was coming from the dash speakers. I read about the 'cubby' subwoofers, but I decided they weren't for me. 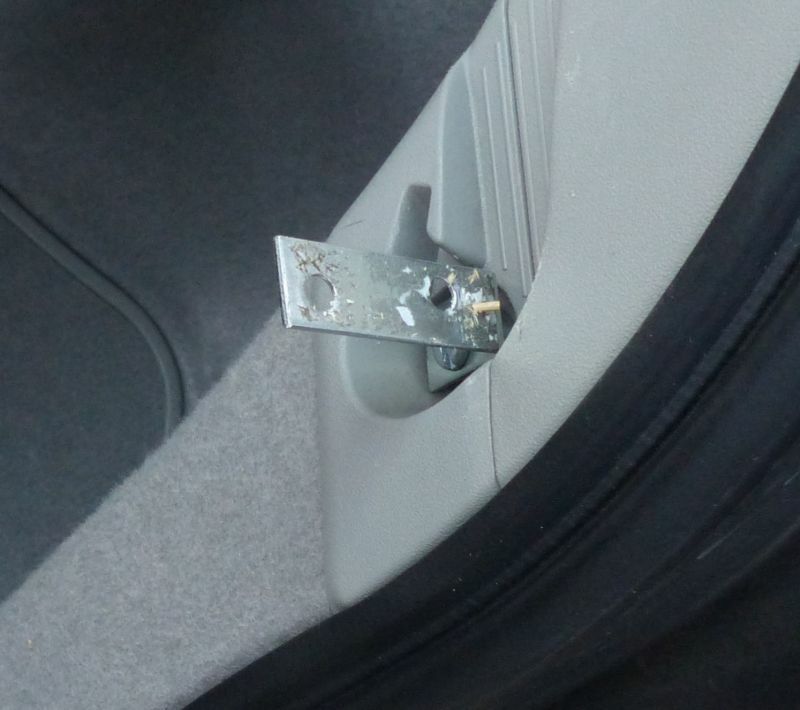 (These mount in one of the side areas at the rear of the trunk. I would estimate their volume to be about 1/2 a cubic foot.) Subwoofer efficiency is based on several factors. The efficiency of the driver, the size of the enclosure, and the port. The cubby subwoofers have a tiny volume which doesn't help efficiency. They also have no port, which also reduces efficiency. I acquired two Jensen JW-12 woofers, which have an efficiency of 92db/watt. I have seen a few more efficient woofers, and a lot of less efficient woofers. Why someone would select a woofer with an efficiency of 85db is a mystery to me, unless they want to brag about having a huge amplifier. Since my woofers are 7db more efficient, if I used a 100 watt amplifier, I would need a 635 watt amplifier to get the same volume with 85gb speakers. I also decided I wanted to be able to use some of my trunk space. I fabricated an open shelf enclosure for my two woofers. It was relatively simple to build but it has some potential disadvantages. It will present an underdamped load for almost any woofer. This means the frequency response needs to be equalized. Fortunately I have a JBL-MS8 which has a great DSP based equalizer. I made a cardboard mock-up of the entire rear shelf area. It turns out that it is possible to build, but next to impossible to put in or remove from the car once constructed. I decided to cut away the sides a bit (as they stick out the most) in order to make it possible to install and remove. I built the shelf out of 15/32 plywood. It is roughly 44 inches wide and 30 inches long. I removed the privacy screen and fabricated a piece of wood to replace it. It is 1.5 inches by 1.75 inches in cross section. The ends have a 1/8 inch thick piece of plywood attaches, as the privacy screen is really 1 5/8 inches thick at the ends. This is visible on the right side of the 2nd picture. This was a bit of work. It might have been easier to remove the screen from the privacy screen aluminum piece, and to drill holes in it to secure the plywood. The bottom of the wood needs to taper a bit because the mounts get narrower near the bottom. The very bottom of the mount has a square bulge which needs to be cut away in the bottom of the wood. Next, I removed the bolts by the rear end of the privacy screen and replaced them with longer bolts with an L bracket attached to support the plywood. I used a spacer about 3/8 inches thick to space the vertical part of the L bracket away from the plastic. I had to cut the bottom part of the L as it got in the way of the plastic recess of the car. Using the cardboard mock-up, I cut the plywood to shape. I had to do a bit of trimming in order to make it fit well. 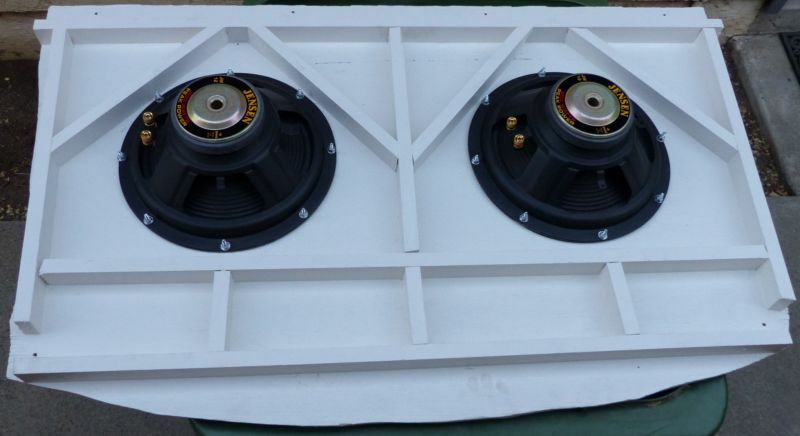 I then cut the holes for the woofers, along with the 8 mounting holes for each woofer. I recommend using a router, as my hole cut with a skill saw was a bit uneven. I had planned on permanently attaching the wooden cross piece to the plywood, but it would make it much more difficult to remove the subwoofer, so I decided to bolt it together. I then reinforced the bottom of the plywood with a bunch of 1x2s. I was planning on nailing, clamping and gluing, but the plywood was a bit warped and difficult to clamp. I decided to use drywall screws to clamp and hold the 1x2s while gluing. In retrospect, I probably should have used two 1x2 reinforcements between the woofers, instead of one. 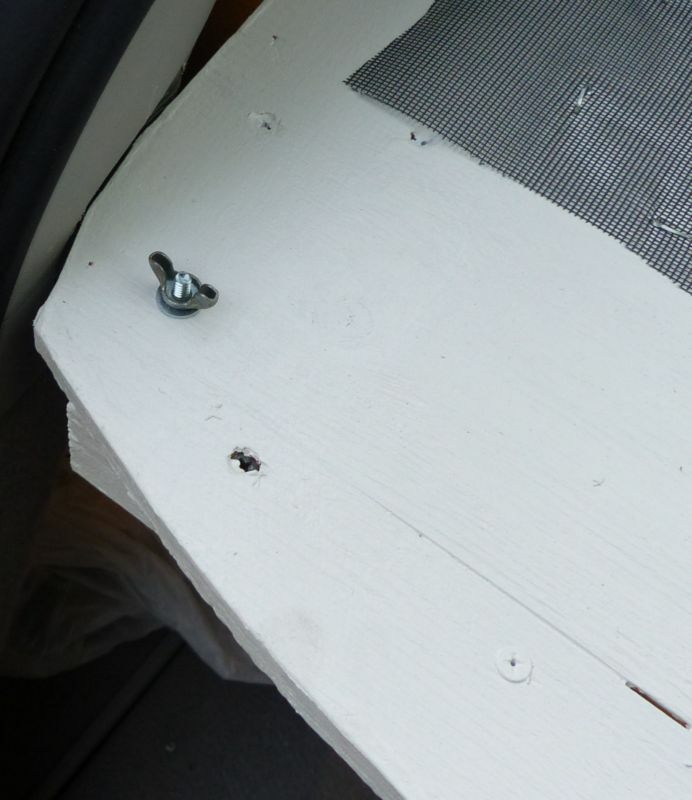 The reason there is a gap at the bottom of the picture is because that is where the L brackets are used to secure the rear of the plywood to the car. You can see a hole on either side where the gap is. A bolt goes from the l bracket through the hole, and is secured with a wingnut on top. I then painted the plywood because it was cheap and very ugly CDX plywood covered with lots of lines used for construction. I covered the top of the plywood with nylon screening so that nothing would fall into the woofer cones. It is secured using staples from an electric staple gun. I also bought some gray grill cloth to cover all of the plywood, but I haven't installed it yet. I may use some kind of sound deadening over the plywood, and under the grill cloth. The woofers had 5 way binding posts. I didn't want to use banana plugs as they might fall out, so I used 1/4 inch spade logs. I would have rather used ring lugs, the the plugs don't completely unscrew. I secured the woofers to the plywood using eight 10-24 bolts, with a washer under the head and under the locknut to help spread the clamping force. 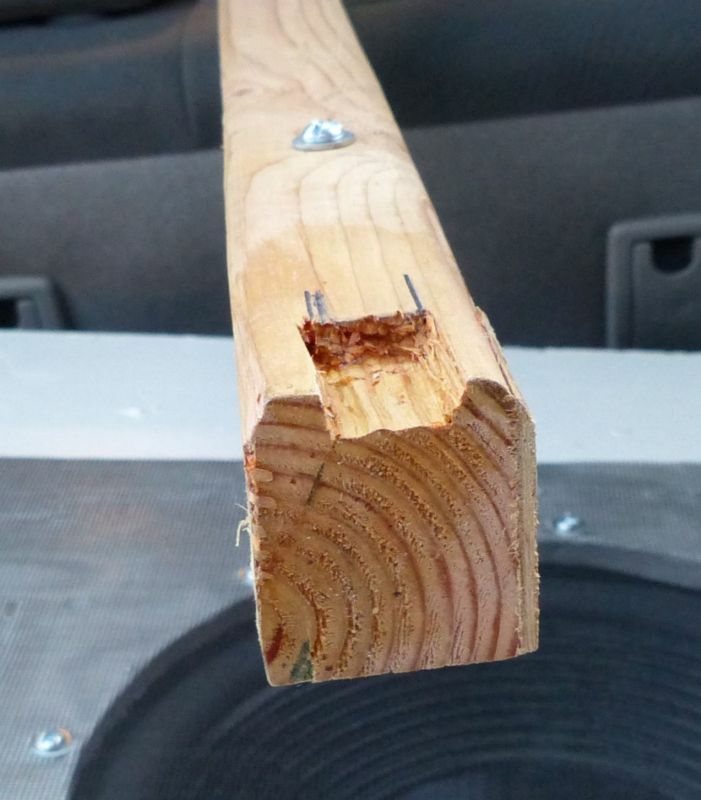 I installed the woofer in the car, and while clamping the plywood to the wood cross piece, I drilled 4 holes to be used to bolt the plywood to the cross piece. The rear is held on with a bolt on either L bracket. I used wing nuts to make it easy to remove. If you look closely, you can see the tops of the drywall screws under the white paint. The black nylon mesh wasn't put on squarely, so it looks a bit odd. It does cover the woofers, and it will be covered up by the grill cloth, so nobody will see it. Using the JBL-MS8, I added the woofers, and set their range to 20-100 hz. The JBL equalized them to have flat frequency response. It has been a bit of work, but I can now play any type of music, including pipe organ music. I should be able to generate 108db at one meter using both of the woofers and 2 channels of the JBL amplifier. I suspect that will be enough, but if not, i have the wiring to add a bigger amplifier. There are no buzzes or rattles, as the subwoofer is securely clamped in place.